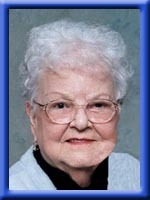 DICKS – Mildred R., 92, of Hunt’s Point, Queens County, passed away peacefully in White Rapids Manor, Fredericton Junction on December 8th, 2009. Born in Port Medway, she was a daughter of the late John and Madora (Clattenburg) Verge. Mildred was one of the first employees at the former Metropolitan Store in Liverpool where she worked for 5 years as well as an Avon representative She was a founding member of the Bayview Senior’s Club in Hunt’s Point and a member of the Senior’s Bowling league. She was a life member of the Ladies Auxiliary Mersey Branch #38, Royal Canadian Legion, Liverpool. She is survived by daughters: Constance (Joe) MacAdams of Geary, NB; Jeanette (Wilfred) Gaston of Doaktown, NB. Son David (Donna) of Hunt’s Point. 6 grandchildren, 12 great grandchildren and 7 great great grandchildren. Brother in law Harold Moody of Deep Brook. Numerous nieces and nephews. She was predeceased by her husband Nash Lee; her sisters: Dorothy Lohnes, Margaret Moody and step sister Nellie. Brothers: Robie, Harris, Walter, Victor, George, Frederick and Arthur and step brother Gilbert. David & family we send our deepest sympathy in your loss. You are in our prayers and thoughts. Please be comforted in the knowledge that others are also missing Mildred’s passing. She was a good friend and supporter of our ministry while at St. James. I would like to offer my deepest sympathy and condolences to David and his family .You are in my thoughts at this difficult time. Please accept our sincere sympathy in the loss of your dear Mother. Our prayers are with you. David & family: We are sorry for the loss of your mother. David & Family, please accept our sincerest condolences. You will be in our hearts and prayers during these difficult times. David & Family, I’m so sorry to hear of the loss of your mother.Take comfort in knowing that she will always be in your heart and memories. We would like to offer our deepest sympathy in the passing of your Mother. Our thoughts are with you. David and Family, thinking of you all in your time of sorrow. I am sorry to hear of your loss and extend my deepest sympathy. May you find comfort and support in the days that lie ahead. I am so sorry to hear about your mother. Please accept my deepest sympathy. My thoughts and prayers are with you. David and family, Sue and I are thinking of you in your time of loss. We would like to express our deepest sympathy and condolences to you during this time as you celebrate the life and honour the memory of Mrs. Dicks. During my growing up days, Mrs. Dicks was always a very kind neighbor who lives just a few houses away, and I remember her and Nash so very well. To David, Connie and Jeanette, your spouses and family, know that we are thinking of you. May the Blessings be. Our thoughts and prayers to all the family..
David & family – We are so sorry to hear of your Mom’s passing. I like to think of the times your Mom & Dad would visit Sears – your Dad with his special brand of humor and your Mom with her kindness and big smile. Our prayers are with you. We would like to send our deepest condolences on Mildred’s passing. You are in our thoughts. We were sorry to see the passing of your mother, Connie. Bob remembers her from the time he boarded with you in Liverpool some 20 years ago. Our thought go out to you in this time of loss. So sorry to hear of your loss. I hear she was a wonderful person, & so beautiful. I am sure she will be missed by all who knew her. We want to pass along our deepest sympathy to the family. We remember your mother & father very well. Now they are together once again. God Bless. David and family we would like to express our deepest sympathy in the passing of your mother. Our sincere condolences in the passing of your mother. I’m sure you will miss her very much. deepest sympathy to the family from the Hatcher family. Edmonton, Alberta. Sorry to hear of the passing of your mother, David. Our prayers are with you and your family. God bless! Please accept our heartfelt condolences with the passing of “Aunt Mildred”. Not directly related we are family of Marilyn Langevin who is a niece. Both “Uncle Nash” and “Aunt Mildred” welcomed us into their home and immediately made us feel like “family”. God Bless. We were so sorry to hear about your loss and wish to extend our deepest condolences. Someone so special, can never be forgotten,.Thinking of you always. I am so sorry to read about the loss of your mother. Mildred and Nash were special people who brightened the community…their joy of life and their love of friends and family are an example to us all. But perhaps Mildred’s greatest achievement was surviving for 12 years as the mother of the class clown! Take comfort in knowing that Mildred will always be admired and remembered by those who knew her.